A Hong Kong court sentenced two former lawmakers to four weeks in jail on June 4 for unlawful assembly inside the legislature, further sapping the energy of local political activists. Hong Kong is officially a part of China but has separate governance under the “one country, two systems” principle. Activists say the lawmakers’ sentence is further evidence of Beijing’s growing interference since the former British colony was returned to Chinese sovereignty in 1997. 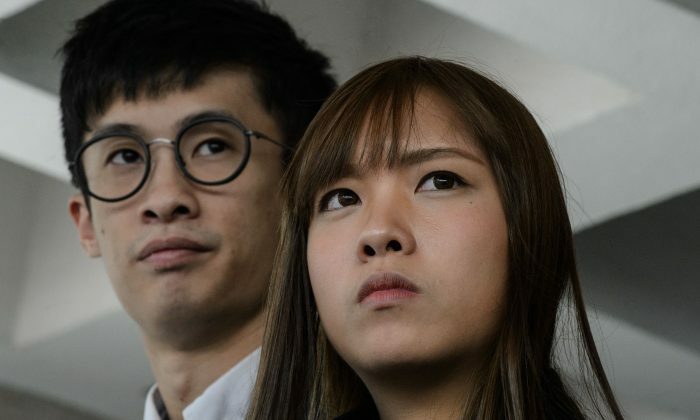 Baggio Leung, 31, and Yau Wai-ching, 26, along with three assistants, were convicted last month for a 2016 incident in which the two stormed the legislative chamber after they were barred from re-taking their oaths to serve. Leung and his assistant said they will appeal their sentences. After they criticized Beijing during their October 2016 swearing-in, the Hong Kong government accused them of making invalid oaths, and a court disqualified them from their posts. As court proceedings were underway, the highest body in China’s rubber-stamp legislature, the Standing Committee of the National People’s Congress, issued a legal interpretation about oath-taking that drew protests by Hong Kong lawyers. Former UK foreign secretary, Malcolm Rifkind, called the prison sentence “deeply disturbing,” according to a press release by the London-based NGO Hong Kong Watch. “Imagine if a Member of Parliament were sent to jail for staging a protest inside Parliament,” he said. Yau and Leung’s election two years ago marked a high for the youth-led movement that championed Hong Kong’s interests and self-determination. Their political party, Youngspiration, emerged after the “Umbrella Movement” protests in 2014, when scores of demonstrators occupied major highways for over two months demanding the right to popular vote. Alarmed by the dissent, Beijing’s leaders tightened control over the city. By Venus Wu. Epoch Times staff member Annie Wu contributed to this report.